Stir together flour and powdered sugar in a medium bowl. Cut in butter using a pastry blender or fork until butter is the size of peas. Stir in milk and egg yolk. Wrap tightly and refrigerate for 30 minutes Preheat oven to 375°F. Press equal amounts of mixture into six 4-inch tart pans with removable bottoms. 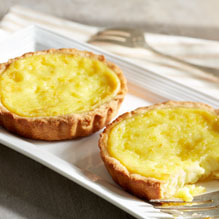 Whisk together all filling ingredients and pour into tart shells. Place on a baking sheet and bake for 20 to 25 minutes or until centers are set when gently tapped. Let cool before removing from pans. Makes 6 tarts.